Objective: To examine the information about Down syndrome (DS) provided to pregnant women in Canada through a content analysis of prenatal screening information pamphlets. Methods: Prenatal screening information pamphlets were requested from Canadian prenatal testing centres. In total, 17 pamphlets were received (response rate = 65%). Statements presenting information descriptive of DS were identified from the pamphlets, and a content analysis was carried out. Specifically, each statement was analyzed with respect to both the content and the valence of the information presented on the basis of predetermined decision rules. To enhance reliability, four independent raters reviewed each statement, and any differences in coding were resolved through discussion. Results: In total, 158 statements descriptive of DS were extracted from the pamphlets. The categorical analysis revealed that 91% of the extracted statements emphasized medical or clinical information about DS, whereas only 9% of the statements relayed information pertaining to psychosocial issues. The valence analysis revealed that nearly one half of the statements portrayed a negative message pertaining to DS, while only 2.4% of the statements conveyed a positive image of DS. Conclusion: The pamphlets provided to pregnant women do not appear to present a comprehensive, balanced portrayal of DS, which may serve to limit informed decision-making. J Obstet Gynaecol Can. 2012 Aug;34(8):760-8. 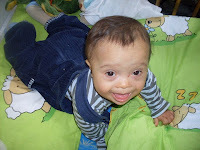 The portrayal of down syndrome in prenatal screening information pamphlets. Lawson KL, Carlson K, Shynkaruk JM. Department of Psychology, College of Arts and Science, University of Saskatchewan, Saskatoon, SK.